In honor of Shout Factory/GKid releasing Studio Ghibli films on Blu-Ray, Adam is writing an on-going series highlighting some of the best Studio Ghibli films. The series continues with Hayao Miyazaki’s Princess Mononoke. A few years after Porco Rosso, Hayao Miyazaki would begin work on his most complex and possibly greatest creation; Princess Mononoke. What began as some basic sketches in the 1970s would fully form over into the film Princess Mononoke released in 1997. The film would go onto being the highest grossing film in Japanese History (until Spirited Away). Not your typical blockbuster nor your typical female protagonists, Princess Mononoke never gives anyone or anything an easy out. The strength in Princess Mononoke lies in its complex moral center. Make no mistake this film fantasy epic of the highest order. The story at its core is not your typical good versus evil yarn that most fantasy epics are at their core. The film brings more complex female characters than most movies about complex human beings filmed in live action. San, Lady Eboshi, Moro, Hii-sama make up a beautiful tapestry of female strength and convictions within the film. None are reliant on a male figure though the male figures play a part in their lives. San and Lady Eboshi begin as enemies both with different goals. Rather than make one the villain and the other the hero Miyazaki allows us to see them as fully dimensional characters. San though she wants to save the forest and the spirits within savagely murders people and uses her hatred of humans as her fuel. Lady Eboshi takes in lepers and prostitutes giving them a home where they have been ostracized by others but she uses them to destroy the forest and the ecology around iron town in pursuit of money. There is no clear-cut bad person or a good person in Princess Mononoke only people with good and bad in them. No one, especially the women are marginalized in the film. Part of the fascinating aspect of the film is how it takes the male, female dynamic within fantasy subvert them. Much of fantasy fiction is problematic, to say the least. Here Miyazaki takes those dynamics and just throws them out. 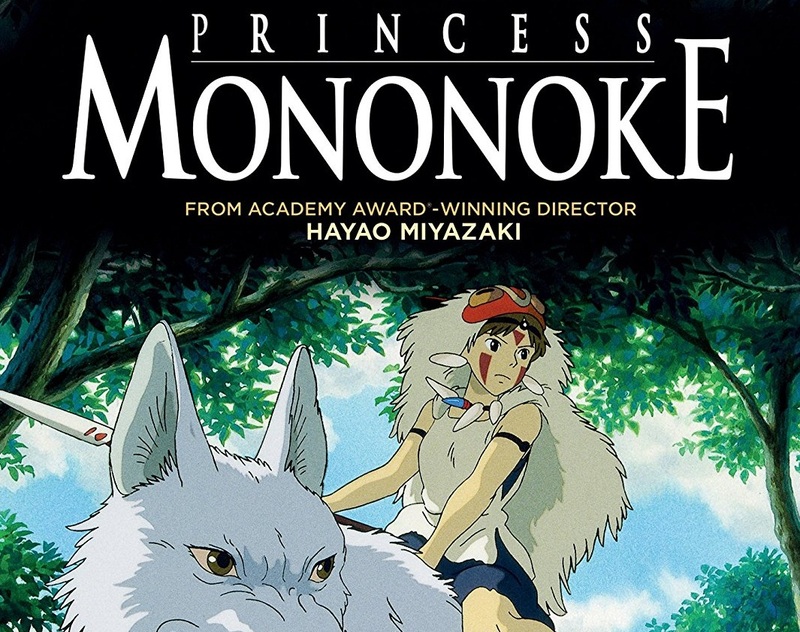 Princess Mononoke is an ironic title as many who see the film sight-unseen will be shocked to learn that A.) there is no real Princess and B.) the word Mononoke is never explained. Those expecting the troupes of a Princess film should look to the Japanese Poster to have a better idea of the type of film this is. Much of the fantasy storytelling clichés are here but are reversed. It is a young man (not girl) that must find a cure for a curse put on him. Ashitaka (said boy) has a magical animal and sets off to find the cure for what ails him. The entire creation of Ashitaka as a character is designed around subverting the male fantasy ideal of the errant knight. The character himself though capable is lost without the women who guide him through his journey. Both San and Lady Eboshi at separate times save him from certain doom, in the way that the “damsel in distress” trope plays out in other fantasy epics. Ashitaka is our “damsel” and is most certainly “in distress” but Miyazaki’s touch is so deft and light that one may not even recognize just how much subversion the director is doing to the genre. Even the ending of the film feels less masculine with the conflicts resolved through communication and healing, not destruction or death. This is an ideal that is at its very fabric anti-Fantasy. The most heralded classic of the genre The Lord of the Rings, which is said to be an anti-war tomb, at its end shows that they only way to bring peace is through war and destruction. Miyazaki rejects that sentiment wholeheartedly with Princess Mononoke. In his film, it is only once the characters see the larger picture does the conflict resolve itself. San and Ashitaka at the end are attempting to reason with, not kill, with a man who’s done nothing but kill and lay waste to everything in front of him the entire picture. The forgiveness and a communication rather than destruction is the most humane and feminine ideal in Miyazaki’s career. Princess Mononoke isn’t just a high water mark for animation but is one for fantasy and female lead films. GKids/Shout Factory has received a brand new remaster from Studio Ghibli for their Blu-Ray release of Princess Mononoke. The original transfers for Bu-Ray and DVD were good. This new version looks stunning. The animation lines, colors everything looks cleaner without a hint of artifacting which can definitely be a problem with animation (and was, unfortunately, an issue on the original DVD). Bravo to GKids for the care and time that went into this particular transfer as the original seemed to be the Studio Ghibli titles in most need of a new remaster. Fledgling animators take note that the entirety of the film has been presented in Story Board format. Further making this special, these are Miyazaki’s own hand-drawn storyboards. I would also say anyone that has even a passing interest in directing action and fantasy should study Princess Mononoke’s Story Board Feature. Watching the film with this feature toggling back and forth between the completed film and storyboards gives a true insight into how Miyazaki builds scenes and action. This one may prove to be invaluable to anyone attempting to direct fantasy as the film does a wonderful job of creating a character out of sometimes silent creatures/characters. Princess Mononoke in USA is a nice 20-minute featurette that recounts the film’s long journey to American theatrical screens (it was 2 years before it premiered in America). The film follows Miyazaki as he goes on tour with his film. I mention the 8-page booklet as it’s a beautiful introduction by Miyazaki himself as it gives insight into the making of this beautiful and powerful film. Princess Mononoke is the gold standard for fantasy adventure and one of the best female lead adventures ever put to celluloid. Highest possible recommendations. Word of Note: Though animated please note that this is a film that is rated PG-13 and earns that rating for the violence depicted. There are moments where arrows cut men’s head clean off, and most other limbs fly off liberally. It is a definitive point but none-the-less one expecting the G rated charms of My Neighbor Totoro or Kiki’s Delivery Service should look elsewhere. The rating is also an indication of content as this film is maturely dealing with themes of conversation, ecology, violence against not just humans but of all species.